After eight years as a Quaker worship group, Farmington Monthly Meeting was set off from Pondtown in 1991, becoming one of the newest members of Vassalboro Quarterly Meeting. Worship at Farmington is unprogammed. Particularly for the early years, minutes for the Farmington Monthly Meeting were recorded (or preserved) somewhat irregularly, though continuously from 1984 to 2012. The collection also contains a set of state of the society reports. information on membership, and memorials. 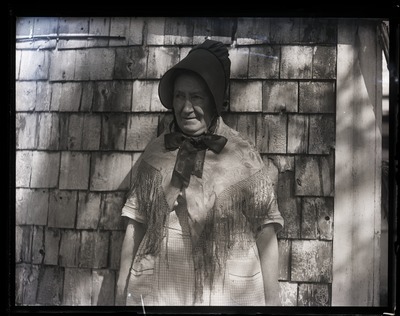 Abbie Loring in Cape Cod Quaker attire, ca.1930. After eight years as a Quaker worship group, Farmington Monthly Meeting was set off from Pondtown in 1991, becoming one of the newest members of Vassalboro Quarterly Meeting. Worship at Farmington is unprogrammed. Cite as: Farmington Monthly Meeting Records (MS 902 F376). Special Collections and University Archives, University of Massachusetts Amherst Libraries.